What is a cloud EPOS? The arrival of cloud EPOS has completely changed the process of purchasing a POS system. The traditional process went something like this: Compare a few complex quotes for various hardware and software modules, arrange some sales demos, and select your preferred system. Then schedule a day for installation and training, before finally getting to use your new EPOS – and hope you still find it does what you need! With cloud EPOS you can now start a trial, download an app, and try out a potential new EPOS in minutes. If it doesn’t do what you need you can try another one. But how does this work? And, if you decide to purchase and start using a cloud EPOS, what do you need? Any EPOS system is built around a computer. This may be built into each individual till, be a separate onsite server, or in the case of cloud EPOS be hosted off site in a data center somewhere. When you download and use your EPOS app, or log into your back office, you are accessing this server over the Internet. If your Internet goes down and your app can no longer access the server your cloud EPOS should have an offline mode to keep you up and running. While this will likely be fine for short outages, sites that expect long outages and have multiple EPOS terminals may want to consider a local server based option. So you’ve downloaded an app, set up the products you sell, and put through some sales. You’ve had a demo session to ask all of your questions and make sure the features you need are covered. 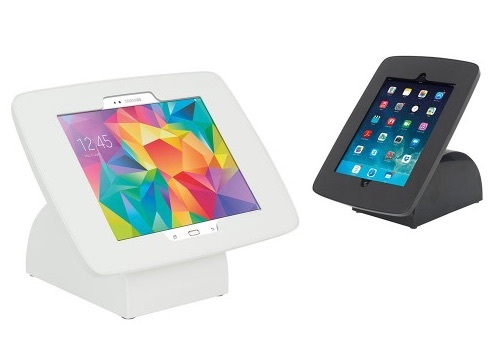 What do you need to start using the EPOS in your venue? We’ve listed the key items below. For BarTab this would be an Apple iPad. (there are pros and cons to any device but we prefer the additional security & reliability provided by Apple’s closed ecosystem to the flexibility offered by Android). 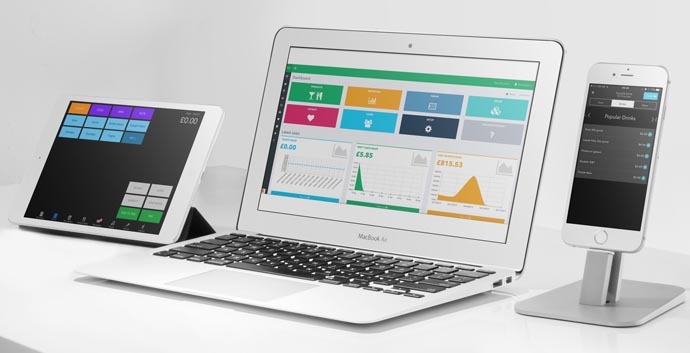 Other cloud EPOS systems will run on different devices. If you’ve already downloaded the app you will have this already, but you may need additional devices depending on how many EPOS terminals you need. You will need a mount for the device you’re running the EPOS app on. There are a huge range of mounts available, but most venues will want something sturdy and secure. We recommend the Moonbase stand, which is easy to set up, flexible, and secure. A receipt printer is needed both for printing receipts and orders, and for triggering the cash drawer. It is likely therefore that you will need one receipt printer for each cash drawer. 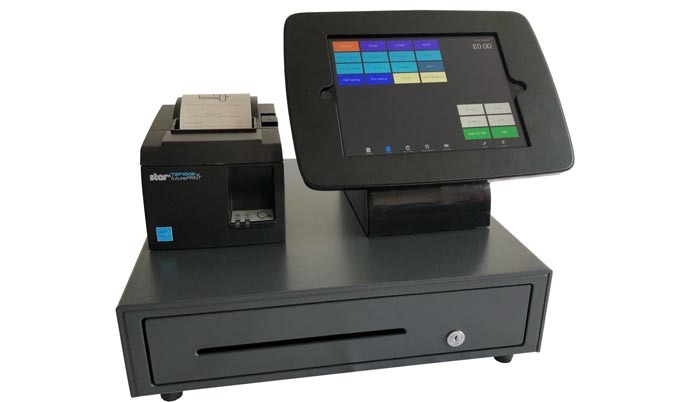 For a cloud EPOS system your receipt printers will either have to connect to your broadband router via a network cable or wifi, or directly to the device running your EPOS app via a cable or bluetooth. A directly connected printer is the simplest option as there is no need to run network cables or connect the printer to your wireless network. We recommend the Star Micronics TSP143IIIU-230, which connects to an iPad via the lightning port. If you want to connect multiple iPads to the same printer then you would need to go for the network option, such as the Star TSP143LAN. (you will then need a network cable from your broadband router to your printer). You will need a cash drawer for each till that you will be taking cash for. These connect to the back of your printers via an RJ12 cable, which comes included with most cash drawers. 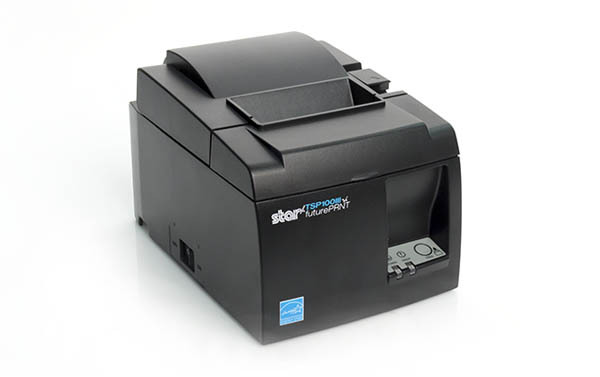 We find the Star Micronics CB-2002FN is a sturdy and reliable cash drawer that will be a good size for most venues. If you want to print food tickets in your kitchen you will need a kitchen printer. These are impact rather than thermal printers as the heat generated in a kitchen can affect thermal till roll. They are generally network printers meaning you will need a network cable from your broadband router to your kitchen. If you’re not able to get a cable run to your kitchen there are wireless models and adaptors available. We recommend the Star SP742LAN. 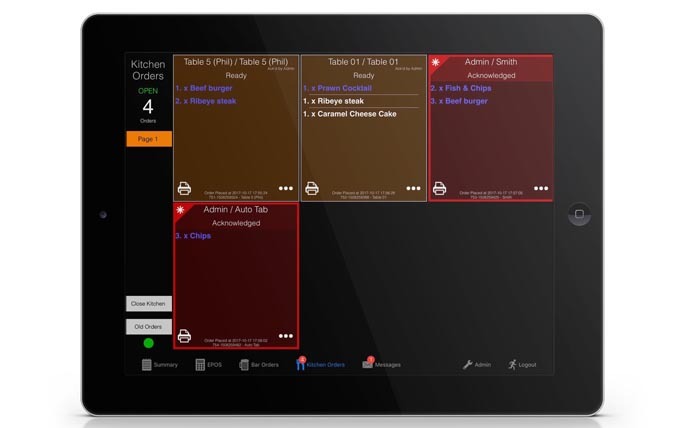 In addition to or instead of a kitchen printer, you can have a screen in your kitchen that displays tickets and allows the chef to mark tickets as ready. The main advantage of this is to enable messaging to your EPOS when food tickets are ready. It can also enable better tracking of service times. To use a kitchen screen with BarTab you would just need an additional iPad. You will need a wireless network to connect your EPOS devices to. For a small set up (1 or 2 terminals) in one room the router provided by your Internet service provider is likely to be adequate. For more than 2 terminals or larger buildings it will be worth investing in one or more wireless access points. These connect to your broadband router and provide a much stronger signal. They can also be placed in different rooms to your main router for covering larger buildings. 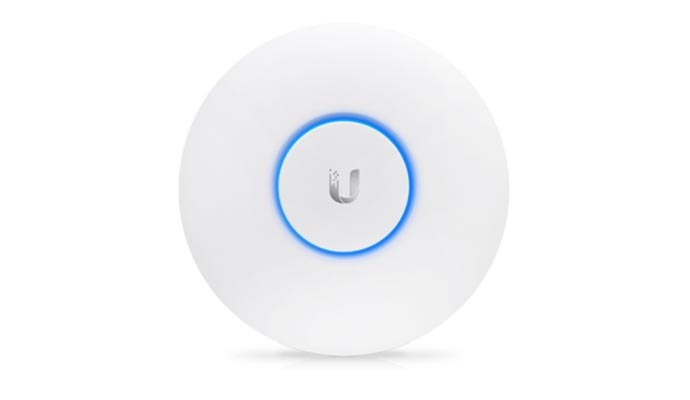 The Ubiquiti UAP-AC-Lite is an excellent Wireless Access Point that will suit most needs. 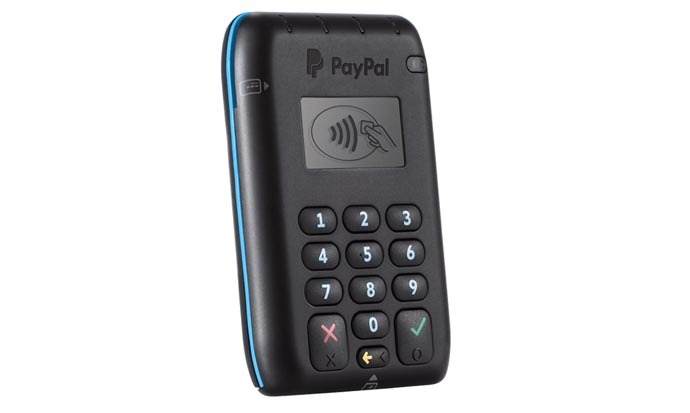 You will need a method of taking card payments. For small sites or those wanting to avoid contracts, this could be a PayPal Here reader. For permanent sites with higher volumes you may be better with PED terminals and a contract with a payments processor. For BarTab we can offer preferential rates with First Data, which we’ve found have provided good savings to many of our customers. For advice on the best solution for your circumstances contact one of our team. All of the above are available in our online shop. If you need help setting up your BarTab EPOS, check out our getting started articles, or contact one of our team.